Guatemala is exposed to multiple natural hazards, including earthquakes, volcanic eruptions (and all their associated hazards, such as ash, lava flows, pyroclastic density currents and lahars), tsunamis, landslides, floods, droughts, ground collapse, tropical storms and hurricanes, extreme temperatures, and forest fires. The impacts of these hazards threaten economic growth, lives and livelihoods. The World Risk Index (2017) ranked Guatemala 4th globally in terms of the risk of becoming a disaster victim due to an extreme natural event. 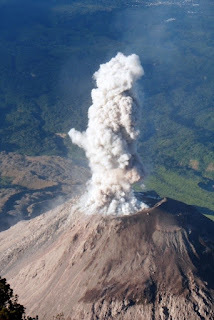 Natural hazards (in Guatemala, and elsewhere) do not always occur independently, but there can be interactions between natural hazards. One hazard may trigger multiple secondary hazards, which can subsequently trigger further hazards. For example, in Guatemala regular eruptions of the volcano Santiaguito (pictured) result in large volumes of volcanic debris. This debris can be mobilised as lahars, and enter the hydrological system, triggering erosion and flooding, with the potential to damage important infrastructure. Understanding potential interactions and chains of interactions can help to improve disaster preparedness and response. During my PhD (at King’s College London, funded by NERC and the ESRC), I spent two-months in Guatemala collecting evidence of potential hazard interactions. 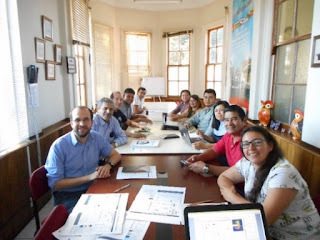 I used fieldwork, interviews and data-generating workshops to help construct comprehensive and systematic frameworks of hazard interactions in Guatemala at national and sub-national scales. These frameworks take the form of visual matrices of primary hazards and potential secondary hazards. This project, and subsequent work outlined below, directly supports the UN Sendai Framework for Disaster Risk Reduction, which calls for new "multi-hazard" approaches that characterise and integrate information about hazard interactions. Through the BGS Innovation Flexible Fund, I recently returned to Guatemala to share this work and discuss with partners how government agencies responsible for hazard monitoring and disaster reduction could use frameworks of hazard interactions. An important step in the research process, and an ethical responsibility for scientists, is communicating and sharing our work with stakeholders, including those who have contributed to the research and those who may benefit from its results. It is a really rewarding part of being a scientist. Knowing that the work I spent many (long) days on as a PhD student won’t just sit on a shelf in the UK, but can support the work of a fantastic and dedicated team of hazard and risk professionals in Guatemala is very special. 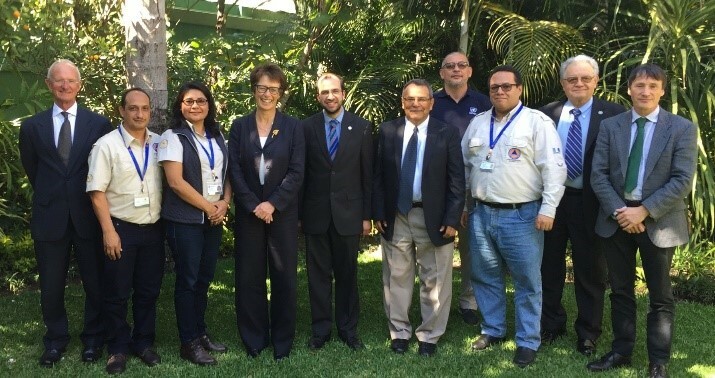 During my recent visit, I presented the hazard interaction frameworks in Guatemala through seminars, workshops and meetings at universities, INSIVUMEH (the National Institute of Seismology, Volcanology, Meteorology and Hydrology), CONRED (the National Coordinator for Disaster Reduction), and the Guatemalan branch of the UN Office for the Coordination of Humanitarian Affairs. Multiple partners identified the value of the frameworks as reference tools in both disaster response and preparedness. For example, some participants noted their use in informing public communications regarding potential secondary hazards after a primary hazard. Others observed interactions in the matrix that they had not previously considered, but they acknowledged could occur and that they could integrate into their planning. All partners agreed that a priority next step would be developing tools that inform municipal level planning and preparedness. The scientific and risk professional teams in Guatemala work under difficult conditions to protect lives and livelihoods. I am very grateful for the help and time they provided during my visits. At the heart of the UN Sendai Framework for Disaster Risk Reduction (and the Sustainable Development Goals) are international cooperation and respectful partnerships. I finished my time in Guatemala by meeting the British Ambassadors to Guatemala and Honduras, sharing the results of our meetings, and discussing disaster risk reduction in the region. We all agreed that there is significant scope for future collaboration between hazard scientists and disaster professionals in the UK and Guatemala. Original research funded by a studentship grant from NERC/ESRC (NE/J500306/1). This work was continued through BGS Innovation Flexible Funding (2017/18) awarded to Joel Gill (BGS Global) and Katy Mee (BGS Geoanalytics and Modelling).